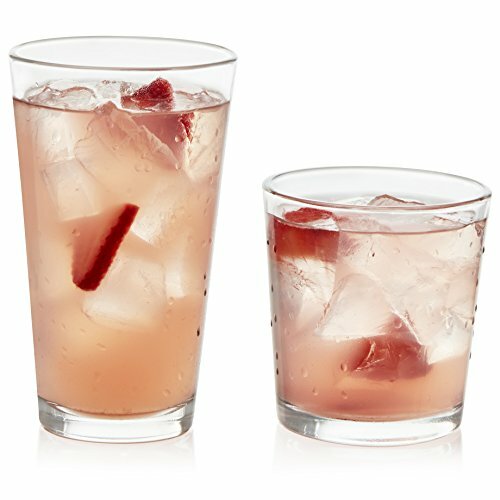 Add some flair to your life with the Libbey Flare 16-piece Drinkware Glass Set! Versatility is the word for these clean, contemporary glassware designs featuring an even flare from base to lip. Not only do they complement any drinkware collection, but they also make a terrific instant starter set. There's plenty to go around, whether you're hosting an impromptu garden party or just sharing a few beverages with loved ones around the kitchen table. Function and style come together in the conveniently stackable Flare set. You'll serve guests a craft beer or cocktail in one of the rocks glasses as effortlessly as you would pour yourself or a family member a nice juice, iced tea, or soda in a weighted cooler glass. After all, they're based on the all-purpose, durable pub glasses that craft breweries love to customize with logos and artwork—so they're built to last while looking great!